Favorite food: Holistic canned/kibble & Moms. Favorite toy: Squeekys and any cardboard. Favorite activity: Rudy: I like riding in the pickup with my Dad. Rocky: I like snuggling with Mom. Rose: Following my new Daddy. Special talents: Digging holes for Moms gardens. Most embarrassing moment: Rudy & Rocky: Fell out of bed. Rose: Fell off top of chair while sleeping. Most trouble I ever got into: Rudy & Rocky: So many--so little space...chewing Mom's chair is most recent. Rose: I'm an angel. My favorite friends: The Girlies and R Sweeties. 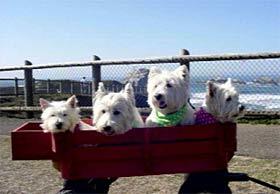 Biggest adventure: Traveling to Westie Events.